Remove the giblets then rinse and pat dry chicken. Coat the skin in ghee or oil. Inside of the chicken, place the Bouquet Garni, ½ lemon and ½ garlic with 1 tablespoon ghee or oil. In roasting pan, place vegetables and potatoes, sprinkle with seasoning and add chicken and squeeze the juice of remaining lemon over the everything. Roast until chicken is golden brown. 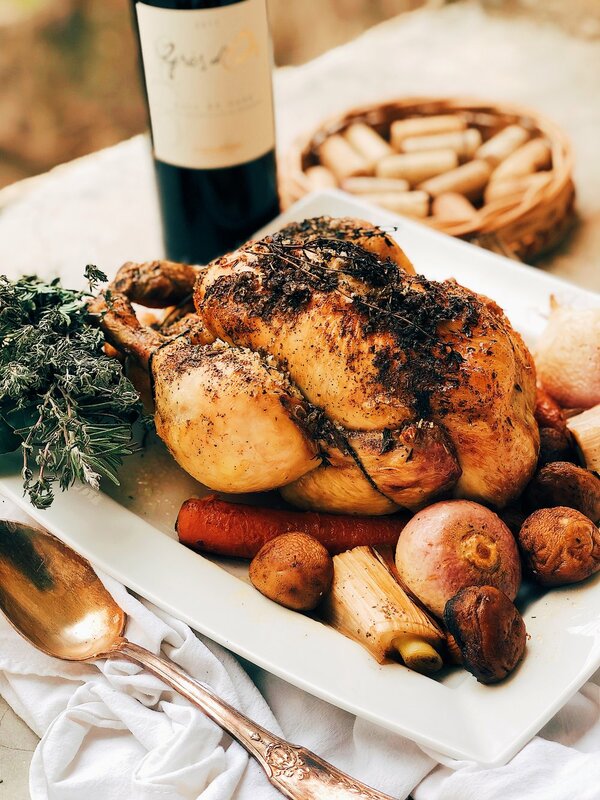 Roast chicken until skin begins to brown, 25-30 minutes. Reduce heat to 350° and add water to the pan if needed. Roast another 25-30 minutes longer ( or until thigh temp reads 165°). Let rest 10 minutes, drizzle pan juices over the chicken and vegetables, then serve.